Did you know that sunscreen expires? Would you know what to do if a mark on your skin started changing shape, color, or size? What are the hours when the sun does the most damage to skin? 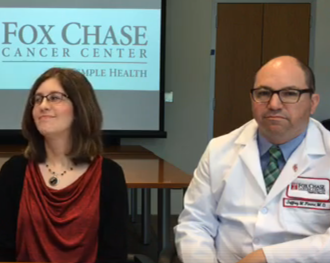 This is the kind of information experts from Fox Chase and the National Comprehensive Cancer Network (NCCN) shared with an audience of thousands during a Facebook Live Q&A on skin cancer on May 10. Jeffrey Farma, MD, a surgical oncologist with a treatment focus that includes skin cancer, and behavioral scientist Carolyn Heckman, PhD, who dedicates much of her research to skin cancer prevention, answered a wide range of questions about prevention, treatment, warning signs, and more. Joan McLure, senior vice president of information products at NCCN, moderated the panel. To join us for future Facebook Live events and stay connected with Fox Chase, ‘like’ Fox Chase Cancer Center’s Facebook page.